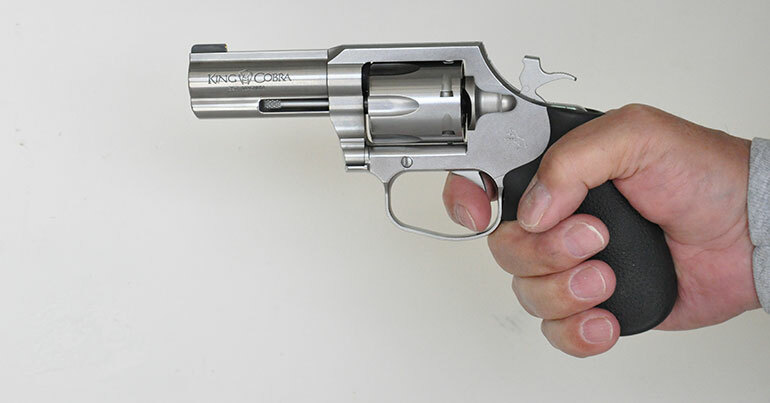 Small, lightweight .357 Magnum revolvers can be terrors, delivering serious punishment at both ends. I’ve trained with, fired and tested most of them so I think I’m on solid ground in saying they can be very unpleasant when fired with hot ammunition. How does that relate to Colt’s new Magnum Cobra revolver? We’ll get to that in a moment. Colt introduced their new .38 Special Cobra revolver to a group of writers at an event held at Gunsite Academy in November of 2016. Much anticipated, this 2 inch barreled snubbie marked Colt’s return to the double-action revolver market after an absence of almost 30 years. The assembled writers remembered the steel Detective Special and the aluminum framed Cobra (discontinued in 1981) so this new steel framed Cobra seemed misnamed to some. Adding to the confusion, the very Python-like clockwork hinted of things to come, although the folks from Colt would only say the action was scaleable. Well, the Python hasn’t made a comeback, not yet anyway, but the new Colt I have at hand is a .357 Magnum with a 3-inch barrel called the King Cobra. This harkens back to another King Cobra, discontinued in 1998 that had a full underlug barrel and adjustable target sights. The King Cobra looked very much like a Python with a solid rather than ventilated rib atop the barrel, a feature this new revolver shares. Colt may be on to something with this 3-inch Magnum. After all, 3-inch barreled Pythons are rare and very collectible and many folks feel the 3–inch guns give the best balance of handling and concealability. The revolver ships in the usual blue plastic case and includes the obligatory padlock, a test target and a very detailed instruction manual specific to this gun. I get a little crazy about instruction manuals because most folks don’t bother to read them and some manufacturers insist on shipping manuals that are generic and not specific to a particular gun. Kudos to Colt for taking the time to produce and include a King Cobra manual. According to my Lyman electronic trigger tester gizmo the double action trigger pull on my sample is 8 pounds, 13 ounces and the single action trigger breaks crisply at 4 pounds, 7 ounces. 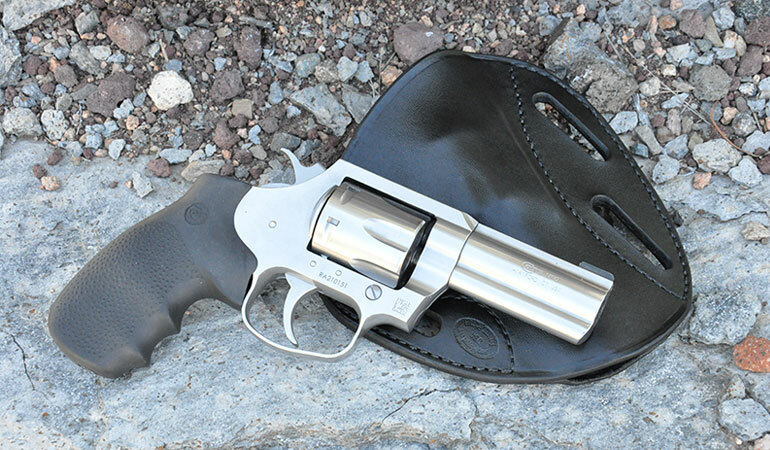 Empty, the revolver weighs 28 ounces and has a loaded, carrying weight of about 31 ounces. Colt used to call revolvers in the Detective Special and Cobra class D-frames. I measured the cylinder widths of a J-frame and a K-frame Smith and Wesson revolver to compare with the King Cobra and found it is right in the middle of the other two, being .1” wider than the J-frame and .05” narrower than the K-frame. While you might have a little trouble finding D-frame speed loaders, not to worry, S&W K-frame speed loaders made for revolvers like the Model 10 work just fine. Every pistol needs a holster so I went to my go-to leather guy, Rob Leahy at Simply Rugged Holsters for a proper shuck. He recommended his Silver Dollar Pancake holster and with it I can find no fault. 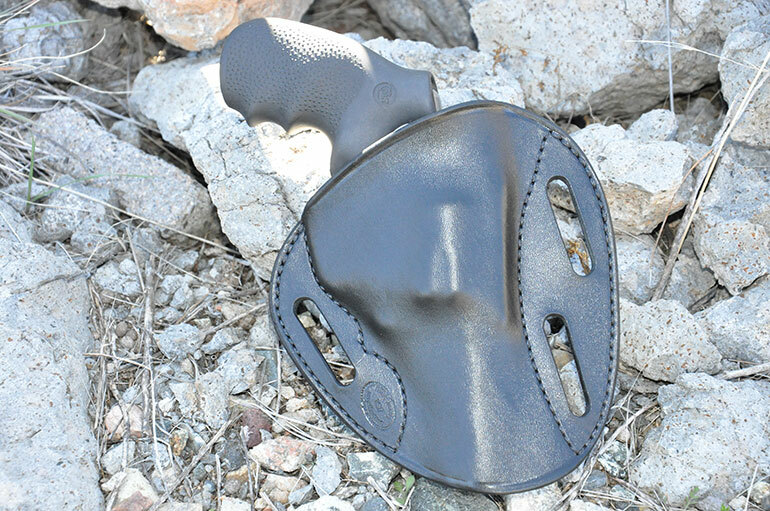 It is highly concealable, comfortable and quick to draw from. As an aside, some folks get a little cantankerous when they notice Rob’s pancake style holsters don’t have a thumb snap securing the pistol. Actually, its not needed because when the holster is secured on the belt it squeezes the holster such that the gun stays put. That’s one of the beauties behind the pancake design, first invented by Roy Baker. So let’s talk a little about double-action revolver shooting. There are two schools of thought on how to run the trigger and back when we all carried revolvers it was a Colt vs. Smith and Wesson thing. You see, some folks preferred the S&W action because it was generally smoother, with no starts and stops, and could be stroked straight through. Colt actions are smooth too but there was a stop in the stroke just before the hammer fell. 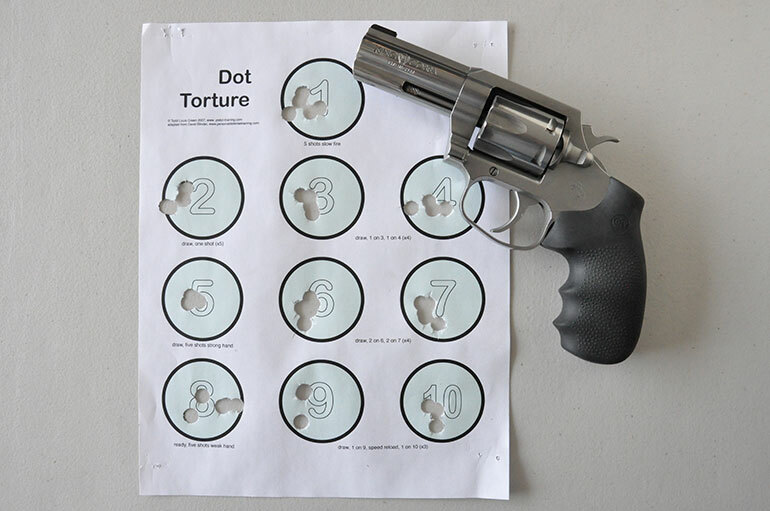 With a Colt you can stroke the trigger all the way through or, if you practice a little, can learn to stroke to that stop point, refine the sight picture, then press through much like having the hammer cocked in the single action mode. This King Cobra has a typical Colt double action trigger pull and I did most of my shooting double action, much of it staging the hammer. 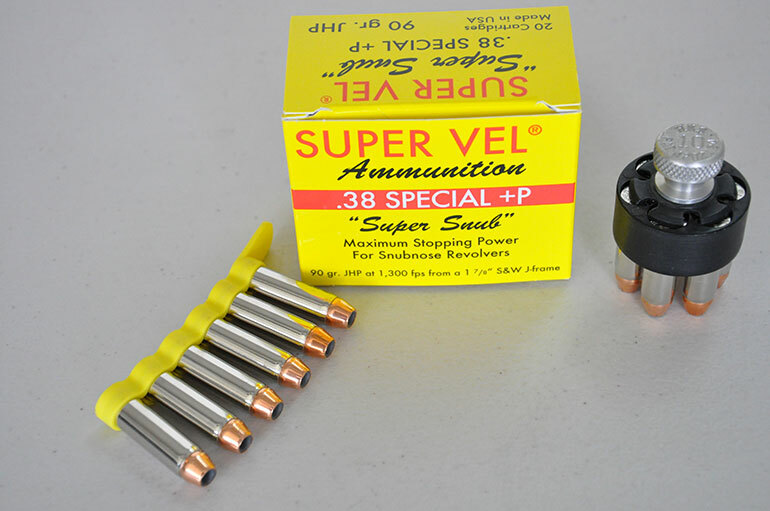 Super Vel “Super Snub” .38 Special, 90 grain (gr.) jacketed hollowpoint (JHP), listed velocity 1300 feet per second (fps), average velocity 1500 fps. Hornady .38 Special Custom, 125 gr. XTP, listed velocity 900 fps, average velocity 634 fps. Hornady .38 Special Critical Defense Lite, 90 gr. FTX, listed velocity 1200 fps, average velocity 1077 fps. Sig .38 Special +P 125 gr. V-Crown JHP, listed velocity 965 fps, average velocity 996 fps. Federal .357 Magnum 125 gr. JHP, listed velocity 1440 fps, average velocity 1395 fps. Federal .357 Magnum 158 gr. JHP, listed velocity 1240 fps, average velocity 1595 fps. Hornady Custom, .357 Magnum 125 gr. XTP, listed velocity 1500 fps, average velocity 1431 fps. What got my attention? Well, as you can see the published velocities don’t always correspond to the gun and barrel length you are shooting but I was amazed by the Federal 158 gr. load hitting almost 1600 feet per second in a 3 inch barrel! Were the Magnums on the brutal side? Yes, but I was surprised at how relatively softly this little revolver feels when shooting hot loads. 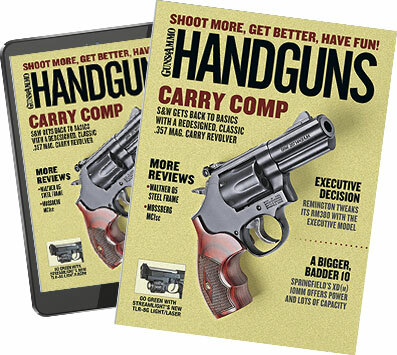 Much of this can probably be attributed to the excellent Hogue grip that absorbs recoil, provides a firm grip and didn’t allow the trigger guard to come back and smack me painfully in the knuckle. 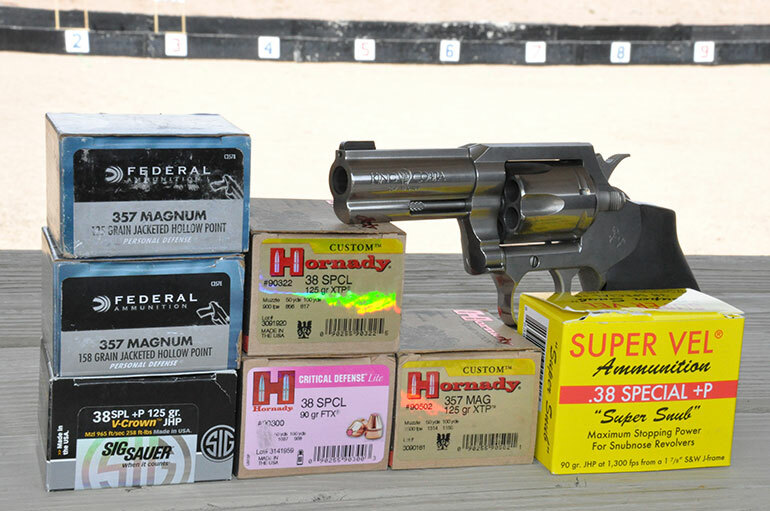 For my money, if I were to carry this little blaster, I would stoke it with the Super Vel “Super Snub” .38 Special load, as it provides an excellent balance of power and control in this revolver and hits to point of aim at 25 yards.